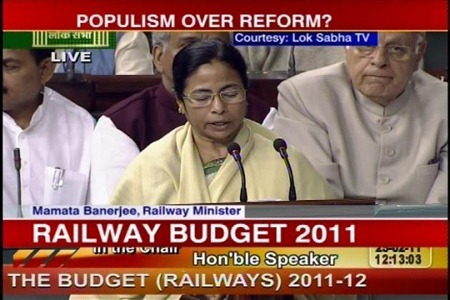 Rail Budget has been announced and Didi (Mamata Banerjee) is in the limelight. In one line – This railway budget is a populist one and aimed at the common man. What is heartening to see is that Didi has made decent provisions for passenger amenities (like introducing trolleys at railway stations ) and also stressed on the safety aspects for Indian Railways by announcing commissioning of Anti-collision devices and doing away completely with unmanned crossings by next fiscal. The big question for every Rail budget is whether the Ticket prices will be increased or not – And the answer is NO. And I am really surprised with that, I was expecting slight rise if train fares, especially because Railways for the first time in last 3-4 years has gone in red. Not only the fares are not increased, in some cases they are even decreased. Like, booking charges for A/C as well as non-A/C seats will be reduced by 50 per cent. Additionally, number of new trains (56 trains, 9 Durontos, 3 Shatabdis and double decker AC trains) were announced as well. All in all, I think the budget was a populist one and on expected lines. No real surprises. What do you make of this Rail Budget ? I feel the Railway budget is a little tinkering here and there. What she did was either keep rates as they are or give more discount to certain catagories, increase volumes, add more trains etc which are very normal. This any Tom can do. I cant help but remember the innovation brought into Railways by earlier Railway Minister Mr. Lalu. He saw Railways as a whole with higher vision. For example, he noticed that Railways has hundreds of thousands of acres of idle land belonging to Railways (in fact Railways is the largest land owner in India). He promoted partnership with Private parties to bring productivity to the idle land, there by increasing revenue (out of nthing). This act not only brought additional revenue, but halted illegal occupations to certain extent, preserving the organization assets. For another example, he noticed thousands of ragpickers in each station. Till then they were treated as pickpocketers, child snachers, dangerous to society. Lalu gave identity to them by giving them employee status and encouraged them to clean stations there by both bringing asset value (cleaner stations) and doing social justice. For another example, when ever there are meetings, he alowed technical people to present their views thereby giving them confidence that they can do something unlike earlier administrations which just dictate tasks to people. This brought new ideas which otherwise could have remained dormant. Ms. Mamata could have looked into this angle (to see Railway as a whole organization rather than just a business venture, doing business with people). It has many assets which are unnoticed till now. She has to bring them to life and productivity. For example, the excess (or rather idle) land with Railways can be put to good use either in the form of Real Estate development in urban areas and for farming in rural areas. Once again I would like to remember, Lalu tried to bring rural land to Jathropa cultivation to make Bio Diesel which can be consumed by Rialways bringing down costs of buying Diesel from outside and also contributing to environment. The only new innovation I see is the Power business. Its interesting. Railways is a major consumer of power. As it depends on other business entities for supply of power, the power is both expensive and unreliable. With dedicated 700MW power plant, the business can run unhindered and cheap. Hope this adds more net worth to Railways. Just remembered another issue which needs the attention of Railways. Every road or Railway line passes through many bridges over small canals, rivers, roads etc. 90% ofthe bridges are built during British times. What the present organization is doing is just using them and increasing traffic, making the bridges weak day by day. Railways realizing the danger use caution and slow down as the train approaches bridges. Every one who travels by trians notices this. Railways can start looking into building new bridges with 21st century technology which can bear more load, more life. This not only allows trains to pass at same spead, but it will bring more productivity. Railways can take up this activity in phases. In first phase identify all the hundreds of thousands of bridges. Start bridge building in no problem areas. Slowly based on the success of the construction, the activity can be expanded to more complicated areas.